For many people who are new to the world of coloured gems, the prospect of buying a significant stone can appear quite daunting at first and after a little while downright confusing and overwhelming. They might quickly discover that prices for stones which seemingly appear the same can vary quite significantly between vendors. Where diamonds are relatively familiar and commonplace with prices highly regulated, coloured gemstones for the most part are not. Coloured gems have been revered throughout history and in every culture for their rarity and otherworldly beauty but over the last century or so have been pushed into the shadows by diamonds. Unfortunately, as a result of this overshadowing, a great many people know very little about coloured gems with the exception perhaps that rubies are red, sapphires are blue and emeralds are green. Beyond that things start to get a bit sketchy. The good news is that in today's high definition world coloured gems are thankfully experiencing a long overdue renaissance. In this article I have tried to touch on a few basic things that I think you need to know and look for when buying a gemstone. Each of these are entire subjects in their own right and there are some very good books, online forums and information available should you wish to know more. I would advise that if you are going to spend decent money on a gemstone, do some research first and get some knowledge. Even at a basic level, being able to differentiate between a poor quality gem and a fine one is a skill that can serve you well and will save you money and frustration in the long term. Like all things in life, its experience that counts and the more gemstones you look at the better you get. Before we begin anything, first some basic gem terminology. TABLE : The top flat surface of the gem. CROWN : The top part of the gem above the girdle. GIRDLE : The belt or band that goes around the middle of the gem. PAVILION : This is the bottom part of the gem beneath the girdle. CULET : The lowest point or bottom edge of the pavilion. FACETS : The polished surfaces of the gem. 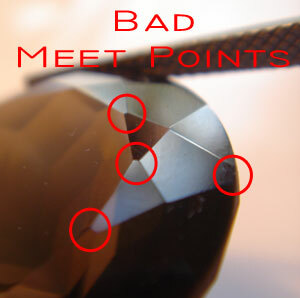 MEETPOINTS : Literally the points or corners where facets meet. This is what it all boils down to... light! The essence of the gemcutter's art is to get as much light as possible to return back up through the top of the stone to your eye and this means getting the angles right. If you want to see the colour, you got to see the light. This illustration shows an ideally cut gem. The angles are correct and light returns back out the top to the viewing eye. This is what you want! You want the light entering down through the crown and table to reflect off the pavilion facets, bounce around and exit back out the top. The more light that does this the better and more brilliant the gemstone will be. On a subtle level, you can see that the proportions and angles are more pleasing to the eye. This might be something that takes a little practise to train the eye to perceive but once you recognise what you're seeing, you've got it. Here the gem is too shallow. The angles on the pavilion are wrong and light escapes out the bottom. This will create what's known as a "WINDOW" or "FISH EYE", something I will discuss further. The angles on this gem are too steep and light escapes out the side of the pavilion. This can create an area of darkening inside the stone called an "EXTINCTION" where little or no light is returned back to the eye. So, as you can see the correct angles on the pavilion and crown affect how much light is returned and thus its brilliance and overall beauty. Now, just to complicate matters, each type of stone (quartz, topaz, garnet, tourmaline, diamond, etc) has a different set of "CRITICAL ANGLES" which determine the correct optimal angles to return the most light. Unless you are planning on cutting a stone yourself you don't really need to worry about what these critical angles are exactly, only that they exist and they impact on what the eye perceives. These angles are something that the gemcutter needs to know as it directly affects the designs that can be used on a particular type of stone and how well they perform. In the world of coloured gemstones, COLOUR is king but the CUT is the power behind the throne. When it comes to diamonds we are all familiar with the four "C's" : Colour, Clarity, Carats and Cut. Great care and attention is paid to the cut when diamond gems are being made. In the highend jewellery shops the saleperson will always direct your attention to the quality of the cut. However when it comes to coloured stones in the mainstream commercial marketplace, for reasons many, varied and just as baffling, the four "C's" no longer remain so, it's more like two and a half "C's". The Cut is quickly discarded and Clarity is diminished. It's all about Colour and Carats and this, in my opinion, does the industry and the buying public a great disservice. There are essentially two types of gemcutting out there in the marketplace : Commercial and Precision. By far the vast majority of gems that you see for sale in the retail sector, by jewellers and gem vendors, on ebay and all over the internet have been commercially cut. In large part this takes place in the cutting "houses" and factories of Asia (Thailand, China, India, Sri Lanka and others) and Africa. To be fair, there is some very good quality commercial cutting being done by some operations but unfortunately most of it is pretty average and that is being kind. Quite a lot of it is very poor indeed. You will still hear the term "native cut" when it comes to describing very poorly cut gems. It's a term I personally try to avoid using but it originates from the fact that in the past and even today, many gems were and still are cut using very basic equipment in very basic conditions by people not paid very much at all and with minimal attention to detail or quality. If someone describes a gem to you as being "native cut" then you should have an idea of what to expect. The primary goal of mainstream commercial cutting is carat weight! The more weight in gems produced the more money made. Carats = $$$. It's a very simple equation. Gems are relegated to being just a commodity. Exceptional stones may be singled out for more care and attention and given to more experienced cutters to handle but by and large most of the stones are cut solely to get the heaviest gem they can. Minimal attention is paid to things like correct angles, symmetry, polish, facet designs, and other considerations. The focus is not to cut the most beautiful gem they can, it is to cut the heaviest. A beautiful gem is not the goal. 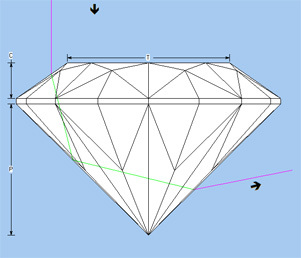 Cutting a gem to correct angles is anathema to this style of cutting because correct angles would usually mean a lighter stone and that means less money. It is a concept completely alien and incomprehensible. Shapes and designs are generally limited to a very basic selection of rounds, ovals and cushions, and usually feature a poorly executed step cut or checkerboard on the pavilion. Commercial cutters are not paid to be inventive or expressive in the work they do for to do so would involve the luxury of time. They are paid to churn out as much as possible as quickly as possible. The cutting factories have large volumes of rough stones coming in that they need to convert into gems. Here is an illustration of a typical commercially cut blue sapphire from Ceylon (Sri Lanka). This is a stone that might once have been called "native cut". I have indicated various aspects that relate directly to the poor level of cut quality and these are things that you will, should you look closely at other gems, see with your own eyes. When inspecting gems I recommend using a good loupe or a magnifying glass. Make sure you have good lighting and don't be pressed or rushed by the vendor. Take your time and don't be afraid to ask questions. A gem like this is also a nightmare for a jeweller to set. Where commercial cutting focuses on return weight yield, precision cutting is at the opposite pole and focuses more on the quality of the cut in order to make the gem look as beautiful as it possibly can. Don't get me wrong, return weight yield is still important and we try to maximise it as much as possible, but as precision gemcutters we pay a lot more attention to details like correct angles, selection of good designs, nice even facets and meetpoints, achieving an excellent polish, not leaving scratches, getting a high degree of light return and really showing off the colour. We want to realise the potential within each gem we handle. This however comes at a price and that price is time. Where a gemcutter in a cutting "house" might churn out dozens and dozens of gems in a day, a precision gemcutter might produce only one, two or maybe even three on a good day. There are those that can do more, and those that do less. Each precision gemcutter has their own way of doing things. How long it takes to cut a gem depends on the size and type of the stone being cut, the complexity of the design and other factors. Precision cut stones are usually quite bespoke in nature. Gems are often commissioned by a client or jeweller and are cut to specified sizes, designs and colours. They are in effect "tailor made" or "made to order" gems. The result is a gem that is full of life and colour, dazzling, special and unique. They look absolutely beautiful. The ironic thing is that, given two rough stones like two blue sapphires of an equivalent quality which would produce the same length/width size, the precision cut gem which would be lighter in carat weight can actually demand more per carat then it's heavier, poorly cut commercial mate. An additional benefit is that the beautiful precision cut stone will in all likelihood sell quicker and look so much better in the setting. It's a lot easier to sell a beautifully cut gem then a poorly cut one. 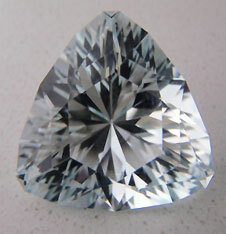 The money supposedly "lost" in a reduced carat weight is more than made up for by the beauty and quality of the cut. This however involves a shift in the way the marketplace, jewellers and vendors view and think about coloured gems, from the mindset that bigger and heavier is better to one that instead sees and appreciates the beauty and elegance of a finely cut gem. Let me give you a couple of examples. One of the things I provide to the jewellery trade and the general public is a gem recutting service. The following picture shows two gems that I recut for different clients, the first being a green sapphire, the second is a tanzanite. For each stone I took before and after pictures. 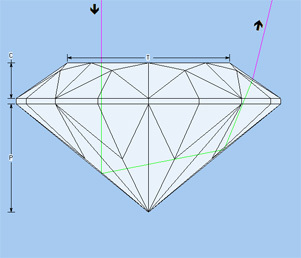 Now, after looking at the picture it should be fairly obvious that a precision cut gem makes the more appealing choice. Yes, the precision cut version of each gem is lighter but geez, they look so much nicer and that makes them easier to sell. 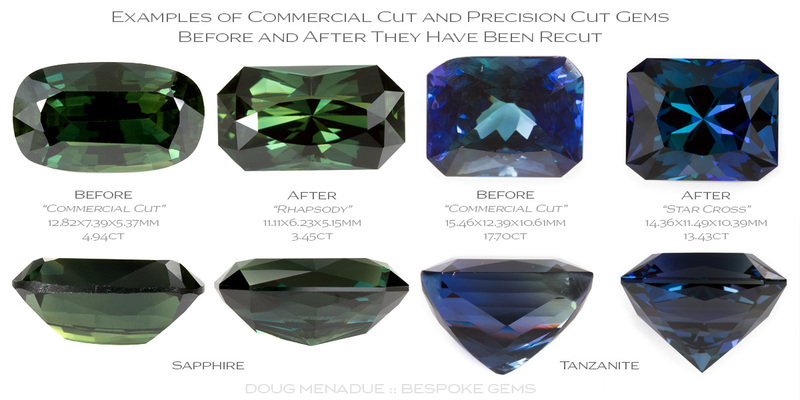 The following illustrates the difference very clearly between a commercial cut gemstone and one that has been precision cut. 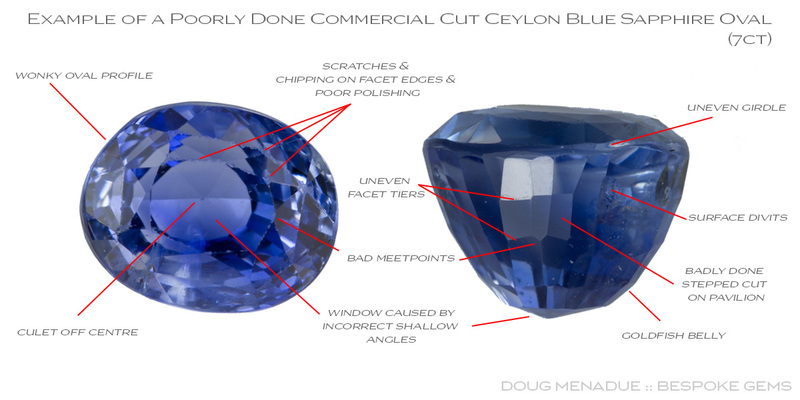 Here I have overlayed the newly recut Ceylon blue sapphire on it's original profile. If you are going to spend alot of money on a gemstone, have a good look at it first. The jeweller or shop assistant should have a special magnifying glass called a "loupe" available. Don't be afraid to ask if you can use it to better inspect the gem. Loupes can take a little practice to get the hang of so don't worry about appearing silly if you don't know how to use one. Ask the assistant to show you the correct way to hold it and to focus the gem. 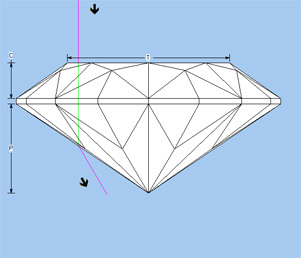 The gem should be held in a pair of tweezers or a gem grip. Ask the vendor if the gem has any inclusions and try to spot them yourself. Inspect the facets, make sure they are evenly polished with no scratches. Check that the meetpoints are good. Does the cutting look sloppy or is it nice and crisp? What about that girdle, is it even or is it up and down all over the place? Is the girdle thick and thin as it goes around the stone? Is it even polished? Just as you would inspect a new car that you are thinking of buying for any marks, scratches, dents and defects, so too should you inspect a gem. You need a good light source to properly inspect a gem. You are looking at a very small object so the jeweller or vendor should have a lamp or light source close at hand. Use it. Another thing about inspecting a gemstone... those overhead halogen lights they have in the shops will make anything dazzle and sparkle like crazy, even a lump of coal. Try to view the stone in natural lighting if possible. If you can view the stone outdoors, position yourself so the sun is behind you shining over your shoulder when you look at the gem. This lets the light fall into the gem and bounce back out to your eye. Gems can sometimes look a little different under different lighting conditions. Artificial lighting, fluorescent and incandescant lights can make certain stones appear muddy and dull or even slightly alter the colour. Again, try to view the gemstone in a range of different lighting, including preferably good old daylight. Some gems really shine at night and look magnificent, aquamarines and blue topaz are good ones for this... they love the lights. Windows - Who Let The Light Out! So, what happens when a stone has been cut with incorrect angles that are usually too low or shallow? You get what's called a "WINDOW" or "FISHEYE" right in the centre of your gem. This is probably the single most obvious thing that you will detect almost straight away when looking at a gem. There is a direct correspondence with the size of the window to the pavilion angles : the bigger the window the shallower the angles. Generally you want to avoid windows in gems as much as possible. If you are spending good money on, for example, a sapphire you want that sapphire to be full of colour and light and not with a hole in the middle that you can see straight through. Windows are usually considered a negative when assessing a gemstone and all things being equal should reduce the price on a gem by some degree. Windows reduce the amount of light, colour and brilliance that the gem displays back to the eye. There are vendors and jewellers in the marketplace that may try to gloss over the fact that a window is evident in the gem they are trying to sell you, saying that it doesn't matter, that you won't see it in the setting, whatever. To me it's like buying a painting with a hole cut in the middle and the salesperson saying, "oh it doesn't matter, you won't notice it once it's framed and hung." Here is a simple test to see whether you've got a window in your gem. Take the gem and place it over some writing, like a newspaper. Next, looking directly through the table (top) of the stone do you see the writing? You'll know straight away if you've got a window or not. 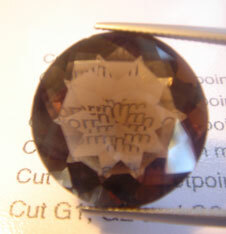 The following is an example showing a commercially cut round smokey quartz being held over some text. Note the window through which the text is easily seen. It's pretty obvious isn't it. For comparison, the gem on the right is a correctly cut topaz. Windows impact the colour, brilliance, fire and scintillation of a gem and can result in a gemstone that looks lifeless, flat and dull. Compare that smokey quartz above with the precision cut topaz... chalk and cheese. The topaz has been cut to correct angles and everything goes right into the centre as it should. One last thing on windows - pretty much any stone, commercial or precision cut will, when tilted or viewed at an angle, exhibit some degree of windowing through the side of the pavilion. This is normal and for the most part unavoidable. What we are concerned with when we are talking about windows is what we see when viewing the gem perpendicularly, directly straight down, through the top of the table. A particular characteristic of commercially cut stones is what I like to call the "goldfish belly". This is regularly seen with sapphires such as the one shown previously. Basically all the weight is concentrated underneath the girdle in the pavilion giving the gem a look that's bulbous and out of proportion. The angles curving down the pavilion are too steep and as they near the bottom kick in under to the culet where they are too shallow, resulting in a window. When a gem has this sort of bulbous pavilion it's a sure bet that the crown is almost as flat as a pool table. This further dulls the gem as a well proportioned crown is critical to maximising the colour and dispersion (ie. think sparkles and fireworks). In the diamond world, much is made of clarity. We are familiar with terms IF (Internally Flawless), VSI1 (Very Slightly Included 1), I (Included), etc. There is a well defined and established grading system. However, where diamonds tend to be relatively small, coloured gems are normally a lot bigger which means the chances of some sort of inclusion greatly increases. In the world of coloured gemstones we still pay a lot of attention to a gem's clarity however the grading system is not particular well defined and tends to be quite subjective. Normally you want to find a gem as clean as possible. Eye clean is a term I use to describe a gem that, to the unaided eye, is clear of inclusions. That is not to say it is flawless, just that to the eye under normal conditions, the gem appears clean. There might well be some very tiny inclusions that are present but they do not impact the beauty of the gem. Look for any flaws or inclusions that might be present in the stone. Often stones can have internal flaws that are not easily visible at a quick glance. Its only later when you are at home and having a good close look at your purchase that you realise there's a crack or large veil in the stone that you didn't see when in the shop. Avoid the disappointment and really check that stone out first. With the gemstones that I cut, I try my best to identify and describe any flaws or inclusions that might be present in the stone and give an indication as to how significant they are. Sometimes they are very very minor and barely noticable, other times they might be more so. Generally I try to cut my gems as clear, clean and flawless as possible. However, not all inclusions are detrimental or flaws. 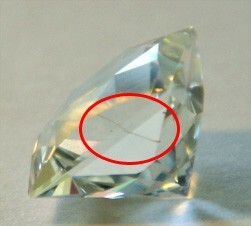 Often there are natural inclusions such as "needles" in a gemstone. 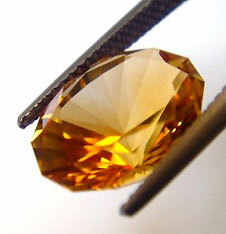 In this example, an O'Briens Creek topaz is shown that has a single needle inside it. These needles are formed from different minerals, such as rutile. Rather then being a negative, people often look for these as a sign of a genuine stone and not an imitation. They also add something interesting to the stone and can very often be quite beautiful in their own right. Emeralds are a particular case. It is almost impossible to find an emerald that is completely clean. It is totally accepted in the industry for emeralds to have inclusions, indeed, if it didn't have inclusions then it would be highly suspect and probably a fake. Rubies are another stone that often has inclusions. Flawless rubies are scarce and incredibly expensive. Sapphires on the other hand you can quite reasonably expect to find very clean. So depending on the stone, the type and quantity of inclusions, how visible they are and so forth, all these things need to be considered. However, just because a gem has an inclusion doesn't mean it should be dismissed out of hand. No! It's just one factor of many that needs to be taken into account. Meetpoints are simply the points where facets meet or intersect. 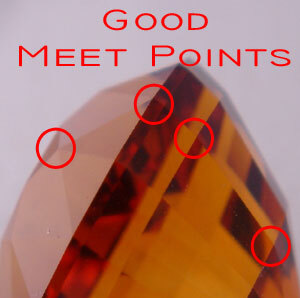 In a finely cut gemstone, these meetpoints are as precise and accurate as possible. 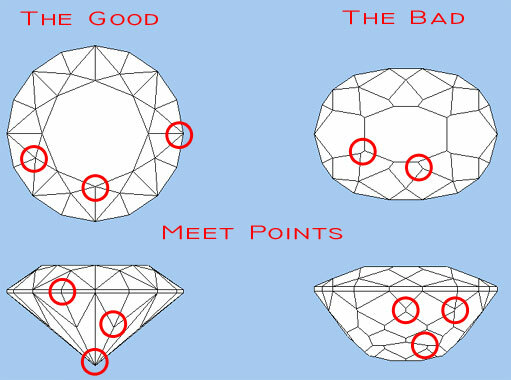 In the average commercial cut gem the meet points tend to be a bit more sloppy. Good meetpoints are a pretty fair indication as to the level of care and attention that went into cutting the gem. It's also a measure of the skill of the gemcutter. The facets meet at nice, crisp points. The facets don't quite meet at a point. HUE : The actual "colour", eg. red, blue, green. SATURATION : The richness or vividness of the hue. TONE : The lightness or darkness of the hue. At the risk of oversimplifying a complex subject - trust your eye. Be wary of gemstones that are so dark you cannot see through them and appear to "swallow" the light, where there is little brilliance. Garnets and sapphires are a common one for this. It is not uncommon for a client to ask me for stone where the colour must be a pure hue, for example, it must be a pure blue sapphire or a pure red garnet. Nature seldom works like that. Finding a gem with a pure single hue is a very rare thing indeed and the price can skyrocket accordingly. I could look at and cut a hundred pieces of rough and not one of them will be a pure hue. The vast majority of gems will have some degree of secondary hue. For example sapphires will often be blue with a hint of a green, or red garnets with a touch of orange. It's just how these stones are. Having secondary hues is in no way a bad thing as this can add wonderfully subtle levels of complexity, beauty and depth to the gem. Then there are pleochroic stones which is a technical term for many colours. Some stones are dichroic showing two colours, some are trichroic showing three colours. When you move the stone around and view it from different angles you see different colours. Tourmalines and tanzanites are good examples of this. This characteristic should not be viewed as a negative thing. It's what makes each stone a beautiful and unique creation. For the precision gemcutter, one particular factor that takes some experience is knowing how to orientate a rough stone correctly to get the best colour. This is something that certain stones like sapphires are very sensitive to. 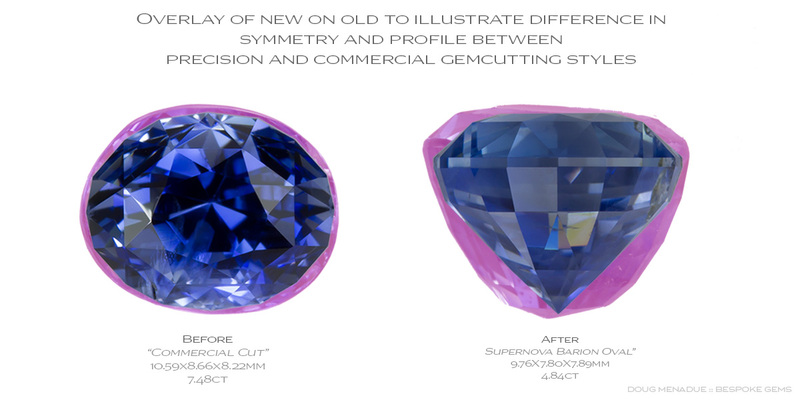 Rarely does the best colour and the best yield coincide and the gemcutter needs to use their judgement and skill to find the most optimal orientation to get the best stone they can. I should mention one particularly fascinating and amazing type of colouration that occurs which I am very fond of, and that is the "parti-colour" which is found in Australian sapphires. Parti sapphires are just awesome and are totally unique. They are gems that show a combination of two or three colours, usually blue, green and yellow. Have a look at my sapphire page for examples of parti colours. These are highly desired for their unique combinations of colours. While we're discussing sapphires, I'd like to quickly mention black sapphires. Look, I'm not going to beat around the bush, I'm a big fan of Australian sapphires, always have, always will be. I think these stones are the fine Scotch whiskey of the gem world, with a depth of colour, complexity and a rareness that has it's counterpart in the very best of single malts. However, if Australian sapphires have an Achilles' heel it is that they can often be darkly saturated almost to the point of appearing black due to the concentration of iron in the ground during their formation. These are usually very darkly blue hued stones and may be referred to as midnight blues. This is all perfectly fine, each stone is what it is. Why I mention all this is that a good quality black sapphire should still be gem quality! Even though it is dark to the point of appearing black, it should still be gemmy and transparent, as free of inclusions as any other gem one might buy. If you hold the gem over a small torch or to a lamp you should still be able to see through it. If you cannot, if the sapphire is opaque, then what you are purchasing is a low grade sapphire, something that we call corundum and this affects it's value accordingly. A high quality black sapphire is not that easy to come across, a low grade corundum one is. Corundum is the family name. When red corundum is gem quality it is called ruby. All other gem quality corundum is called sapphire. Anything that is not gem quality is just corundum. Having said all this, an exception to the case where gem quality sapphire needs to be transparent is with star sapphire cabochons. By their very nature, star sapphires need to be opaque (or semi-opaque) in a particular way for the star to occur. A really good star sapphire is actually quite scarce. What I have said regarding black sapphires needing to still be gem quality applies to other black gemstones, such as garnets which can often be quite dark. There are vendors that will sell low grade material at high prices because they can. They rely on people not knowing any better. There is absolutely nothing inferior about black gems, they have their place and there are people that specifically want them. All I can suggest is that if you are about to buy one, put a torch under it and make sure it's gemmy. One exception is however, black spinel, which is totally opaque and takes an incredibly glossy polish and makes a superb black gemstone. Black sapphires and black spinels are my choices if you are looking for a beautiful black gem. What do I mean by this? Well in the market place and if you are looking for particular types of gems, you will quickly come across special colour terms such as "cornflower" blue sapphire, "siberian" amethyst, "padparadscha" sapphires, "pigeon blood red" ruby or "paraiba" tourmaline and the like. These special terms refer to very particular instances of a colour or a gem coming from a very specific origin. Gems genuinely deserving of these designations usually demand a premium and because of that some vendors are quite flexible and imaginative when describing the gems they have for sale as being such. I've lost count of the number of times I've seen a siberian amethyst for sale which just wasn't one. In the case of siberian amethyst, it doesn't mean it comes from Siberia, it refers to a very specific type of red flash or colour that can appear in certain high quality amethyst. I can't remember the last time I saw a piece of amethyst that could honestly be called siberian. It's very rare... you can most certainly get it, but it is seriously hard to find and comes at a price. A quick scan of ebay would lead you to a different conclusion. A kind of red flash does not a siberian amethyst make. What I would advise is that if you are really after one of these gems that has a special designation, do your homework first. Really find out just what that term refers to and try to see examples of it if possible. It is important to see these gems in the hand as photos do not always do justice to the colours. Sometimes the gem may have a certificate which will have on it the designation, some gem labs will do this, others will not. And as always, make sure the vendor has a money back refund policy. The colour in some stones can shift or actually change depending on the type of light it is being viewed under. One of the most well known stones that changes it's colour is alexandrite. In daylight and under fluorescent lights it can exhibit a strong teal blue colour. View the same stone under incandescent, halogen or even fire or candle light and you'll see a strong purplish red hue. Colour changing gems are rare and expensive. The more marked the colour change is the more the price goes up. Colour shifting gems are also quite fascinating however the change is not as marked. These are gems where the colour shifts from one colour to a neighbouring hue, like from pink to peach. Colour shifts tend to be more subtle. Some garnets exhibit colour shifting. In my mind, colour change is where the colour changes quite dramatically, often to it's inverse or near inverse, for example blue to red. Colour shift is where the colour change is much more subtle and not as pronounced. In the market place, the term colour change is what holds the prestige as opposed to colour shift. It is a subjective thing and some vendors can be quite, ah, imaginative when applying the term colour change to a gem they are selling. Exercise caution when buying a gem described as colour change. Within the marketplace one must be very aware that synthetic and imitation gemstones exist and do so in great quantities and unfortunately the potential to be defrauded is there. Always buy your gemstones from a reputable vendor or jeweller. With many of these imitations it can be very difficult to tell them apart from the genuine item and they are often made to imitate the very finest of their type. Even professional gemlabs can have difficulty in identifying a fake. Remember the caveat : BUYER BEWARE! Imitations have been around for along time. In 1888, French chemist A.V.Verneuil succeeded in synthesizing rubies. In 1910 synthetic sapphires appeared. Today many people have heard of YAG and CZ (cubic zirconia - not to be confused with Zircon which is a completely natural and desirable gem). There is nothing wrong with synthetics and imitations so long as they are designated and sold as such and they do have their role in the market. Vitually every natural gemstone has it's imitations : diamonds, sapphires, rubies, emeralds, amethysts, citrines, pearls and opals, just to name a few. Gemstone treatment is a very common occurrence and is one of those things that invokes a lot of debate in the industry. In short, gemstone treatment is done to improve the quality and marketability of the final gem. The treating of gemstones to improve their colour is as old as the custom of wearing stones itself. It probably first started when someone accidently dropped a stone into a fire and upon removing it found that it had altered the colour. Using fire in this manner is the traditional way to treat many stones but has been superceded in large part by controlled heating in special ovens. This method has wide acceptance in the industry. The types of treatments are many and varied, some are looked upon favourably and others not so. Some treatments are done ubiquitously to certain gemstones to improve colour and remove or mask impurities and flaws thus dramatically altering its appearance and the value. Heating, oiling (emeralds in particular to fill the cracks), irradiation, lasering, dyeing, acid, berrilium are common forms of treatment. For certain varieties of stone in the marketplace, particularly the more expensive one like sapphires, rubies and emeralds, treatment is the norm. A lot of debate centres around disclosure to the buying public of any treatments done to the stone as well as the distinctions between "treatments" and "enhancements". Industry and governmental guidelines can be unclear and in some cases completely lacking. Treating stones is relatively cheap and is done on a large scale, turning inferior stones into something more marketable. This all impacts on a gemstone's value and the industry at large. Generally speaking, an untreated stone of fine quality should demand a higher price and premium when compared to a similar stone that obtained its "quality" via some manner of treatment. Fine untreated stones of any variety are getting scarcer by the day and harder to come by. Heating is probably the most common sort of treatment performed. Do I have a problem with it, short answer is no, not at all. Simple heating is pretty much what it sounds. I'm not an expert on it but from my understanding the sapphires are placed in a kiln/oven and heated to the lowest possible temperature to achieve the desired effect which is to remove or dissolve any silky rutile inclusions back into the matrix of the stone. This has the effect of improving the brightness and clarity and colour of the sapphire. It doesn't damage the sapphire and this technique has been done since the dawn of time and still is being done in places using quite primitive techniques... a person sits next to a charcoal burner with sapphires on it and they blow through pipes to heat the charcoals and induce the changes in the sapphire. Sapphires are formed way way down under the earth's crust where it is pretty damn hot and in the case of the Australian sapphires were brought to the surface via volcanic action which is pretty damn hot as well I'd imagine. It's a bit like baking a cake... most sapphires are perfectly baked, others were pulled out of the oven a bit too soon or cooled a bit too quickly. All heating does is to put the sapphire (cake) back in the oven for another 5 minutes to finish it off. It's just a small extension of the natural processes that the sapphire has already undergone. At the end of the day, you want to be sure that you are buying exactly what you think you are buying. You don't want to discover later down the track that you purchased a fake, or that the gem you were told was untreated has indeed been treated. Buy your gem from a trusted source, be it from a bricks and mortar shop or over the internet. If you are buying over the internet make sure that the vendor offers a money back return policy so that you have a chance to inspect the gem in the hand. If they don't then you don't want to buy from them. It's surprising how different a gem will look in the hand compared to the picture of it on the vendors website or ebay page. If you are intending to drop some serious cash on a beautiful sapphire or similar, make sure that it comes with some sort of certificate and explicitly notes whether it has been treated or not. You may have to pay a little extra for the certificate but it's worth it and comes in handy when trying to insure the gem or sell it later on. If knowing whether the gem has been treated is important to you (and for many people it doesn't really bother them), specifically ask the vendor the question, "has this gem been treated?". If they skirt around the question or reply something along the lines of "it is natural", then that is not good enough. Yes, you can see that the stone is indeed "natural" but what you are asking is whether it has been "treated". It's two different things. Natural does not equal untreated. Sometimes the vendor or shop assistant might genuinely not know whether the gem has been treated and simply answer that it hasn't, that it is "natural". In this case err on the side of caution and assume that it has until proven otherwise. A certificate from a gem lab is usually the best way to go. Otherwise feel free to take their word for it. Again, it might not really matter to you one way or the other. There is absolutely nothing wrong with a heated sapphire or oil-filled emerald, they are both things of beauty, as long as you know that is what you are buying. When trying to choose a gem, something to keep in mind is that the most expensive stone in front you might not be the best stone for you. For some reason you could find yourself drawn to a different less expensive stone because there is just something about it that speaks to you. It might not be the biggest or the best cut, it might just be that you love the colour more. Trust your eye and your first impressions, they are often the best judge of things. Sometimes when a client can't make up their mind between gems, I tell them to take a few days, no rush, and you'll find it's usually the gem that you see in your mind's eye first when you think about them, the one that keeps popping into your thoughts. You'll know which one it is. You'll also know if it's none of them as well.